Tamarind rice is a popular dish of South India.This is a traditional South Indian Tamil Brahmin recipe. This is a fool proof recipe which even beginners can try with confidence. 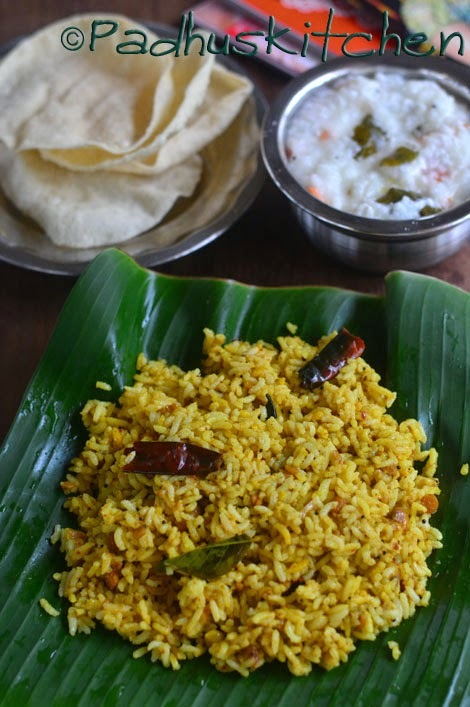 Let us learn how to make this South Indian style tamarind rice or puli sadam/ Puliyodharai following this easy recipe with step wise pictures. Dry roast fenugreek seeds, coriander seeds and red chillies until you get a nice aroma. Dry roast sesame seeds separately and powder everything together. Our spice powder for puliyodharai is ready. Keep it aside. Soak tamarind in hot water (around 2 cups) and extract 2 cups of thick juice from it. Discard the pulp. Heat oil and add the ingredients mentioned under seasoning. You can remove red chilli and then add back to the oil to prevent it from getting burnt. When dal turns golden brown, add the thick tamarind extract, salt and let it boil on medium flame. Switch off when it thickens and oil oozes out. 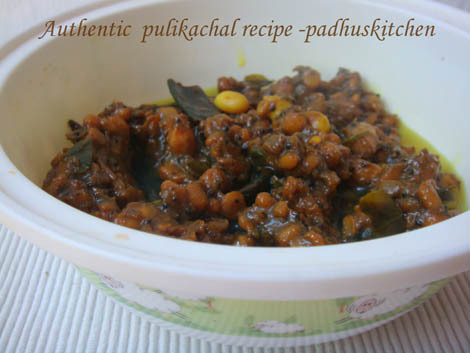 Now the tamarind paste or pulikachal (see Picture below) is ready. Let us see how to mix it with rice. Spread the rice on a plate to cool. When it is warm, add 2 tsp sesame seed oil and 1/2 tsp turmeric powder and mix it gently without breaking the rice. Once it cools, add needed spice powder, tamarind paste and mix the rice gently. Adjust spice powder and tamarind paste according to your taste. Delicious Tamarind rice or Puliyodarai is ready to be served. We enjoyed Puliyodarai with vadams and appalam. You can add less or more spice powder according to how hot you want the rice to be. Similarly, you can add less or more tamarind paste according to how sour you want the rice to be. Adjust as per your preferences. You can store the paste in the refrigerator for 7-10 days and use it when required. If you found this post useful, I would really love it, if you pin it or share it with your Facebook fans or Twitter followers or Google+ circles today. All it takes is a simple click on the “pin it” “like,” “share,” “tweet,” or Google+ buttons below the post. It will keep me motivated. Thank you!. Tamarind rice looks delicious Padu. As open book..this reminds me of chennai..looks tempting padhu. Delicious Looking and great presentation as usual. Trust me,this is my favorite rice and have done it only with the readymade powder till now..your recipe is a reason for me to try it myself now..
luv tamarind rice but i always make frm mtr tamarind pwd mix but now i know to make frm scratch..thnx dear for sharing this wonderful rice recipe ! Tamarind rice looks yummy and tempting. Wonderful presentation. Yum Yum! deliciously tangy rice! My fav pulisadham, love that vadams.. I can get the soury taste of this rice by reading your post. This looks great. Thx Padhu for ur lovely comments n now i got to know of ur wonderful space!Love d presentation of d puliogare..Remember my college days when mom used to pack it in our lunch boxes :) Sure to keep droppin in to ur blog..!! My fav...looks so wonderful!! lovely recipe!! This tamarind rice luks gr8...nice presentation. Delish and yummy. Its perfect and temping. New to your blog and have to go through more of your wonderful homely recipes. Glad to follow you padhu. lovely tamarind rice... i love the flavor and color of it! Thanks a lot. Been trying to get the perfect puliyodarai as my mom's and finally this recipe helped me. It turned out so good that I make it very often now. Btw, I added a little channa dal to the podi too as my mother does. Thanks again. Hi, 70 gms of tamarind is roughly how much? Around 1 tbsp? I have shown in the picture itself. Roughly 2 lemon sized balls. Thank you Kamalaveni. 1 cup rice is 250 grams, so 1 kg is 4 cups of rice. You can calculate accordingly. today I prepared this. Came out really well. 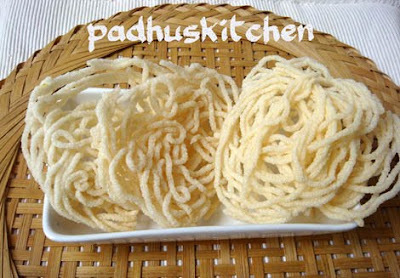 The taste resembled the temple puliodharai. My husband praised me a lot.Thank u so much. Ur blog is a cooking dictionary for me. So delicious.today going to try it.after preparing will say u how it tasted. Awesome. I made it for the first time and reminded me of my Mom and Mami tks. I had a question. How do you cook the raw rice so that grains are separate? For 1 cup of rice, I usually add 3 cups of water. How much water should I add for tamarind rice? Padhu.. i noticed that you didn't mention when to add the spice powder in the recipe. Thinking of making this tonight. Please Help. I have written it clearly. I assume that you did not read the recipe fully. Read the 2nd sentence under "for mixing the rice" and the first sentence under "notes"
I think you did not dry roast the coriander seeds well. Is it possible to store this paste so that we can use it later ? For how long can we store it in fridge ? Also while storing do you recommend adding the spice powder in the paste and store ? You can store it in an airtight container in the refrigerator for 10 days. Store the paste and the spice powder separately and mix when needed. The spice powder can be stored at room temperature. Read the second sentence under "METHOD"
best puli sadam .longigng for traditional tamarind rice was fulfilled by u r receipe. I m a gujarati n I had to meet my Tamil grp of frds for putluck event. Followed ur recipe step by step . Got so many compliments for the tamrind rice . Thank you so very much for posting this recipe. Thanks to your recipe, the dish turned out well. Shall I use black sesame seeds? Hello, is it possible to make this by using Tamarind concentrate/paste instead of raw tamarind? Yes, you can do but I am not sure of the measurements as I have not tried it. You can try, if it turned out well, leave your feedback.